PlayStation Plus 365 days DKK product is a digital code, once bought, the code will be sent to your email or can be downloaded directly from your screen. These codes are original and produced by the developer. These codes have no expiry date. 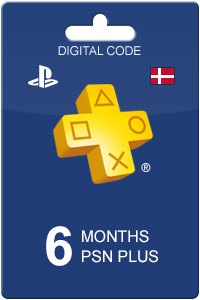 Do you like having a PlayStation Plus subscription and don’t want to update it every month? With the PlayStation Plus 365 days DK card, you can easily use this 12 months subscription. Take notice: this card can only be used in combination with a Danish account. There are various reasons for subscribing to PlayStation Plus. For example, it is very convenient if you like playing games with friends. With a PS4, you can play online multiplayer games with your friends; wherever they may be located. Friends who don't have a certain game also have the ability to join you. With the option ‘share play’ you can let a friend play the game. Be sure to take advantage of PlayStation Plus to save money. Using PlayStation Plus with a PS3, PS4 or a PS Vita, you can download two free games every month. Besides, you get exclusive discounts on games and add-ons which saves you a lot. As a member, you also get to try the newest games, demos and beta versions. With the cloud, you can make back-ups of saved games, ready to be continued on other consoles. At Livecards.eu you will find various PlayStation Plus cards, so you can decide the period of time you want to be subscribed. 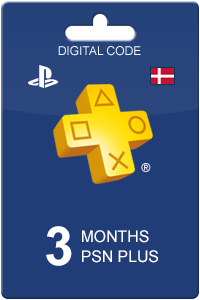 Besides the PlayStation Plus 365 days DK card, we also offer cards with a subscription for PlayStation Plus 90 days DK. You order any of our cards by filling in your personal information and choosing a payment method. After payment, the code will appear on your screen and in your email. Redeem the code on your console or in the PlayStation Store to start your subscription! How to buy Playstation Plus 365 days DK? Buying Playstation Plus 365 days DK from Livecards.eu is as easy as 1 2 3! Simply fill in your email address, select a payment method and complete the payment! We have some of the cheapest Playstation Plus 365 days DK on the market.